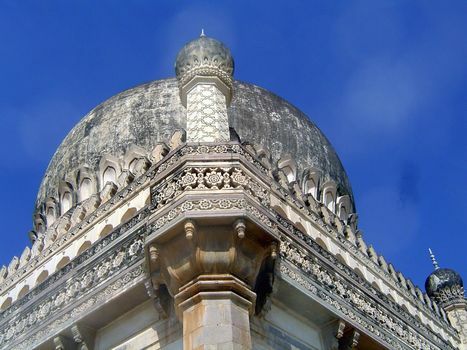 Most of the Qutb Shahi kings reigned long enough to plan and execute a tomb just a little grander than their predecessor's. There are seven here, adherent to tradition yet escalating with each generation. 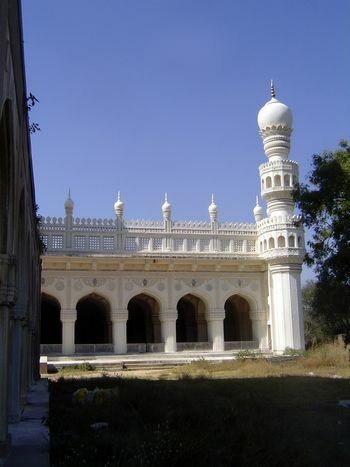 The Great Mosque of the Golconda Tombs, with calligraphy by Saleh Muhammad from Bahrain. It's a tradition found in many Muslim cemeteries: the idea is to let the sound of prayer echo over the tombs through eternity. The founder of the dynasty, Sultan Quli Qutb Shah I, proclaimed his independence from the Bahmani kings in 1518 and ruled his own sultanate for 25 years, until 1543, by which time he was 99. His son could wait no longer and arranged for his father's assassination. Here is the father's tomb, which set the pattern for everything to follow: an onion-dome rests atop a cubic block. 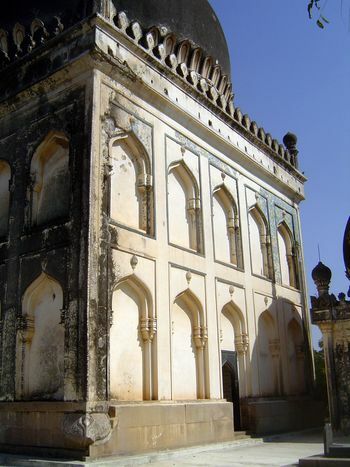 The parricide, Jamsheed Quli Qutb Shah II, reigned comparatively briefly, from 1543 to 1550. 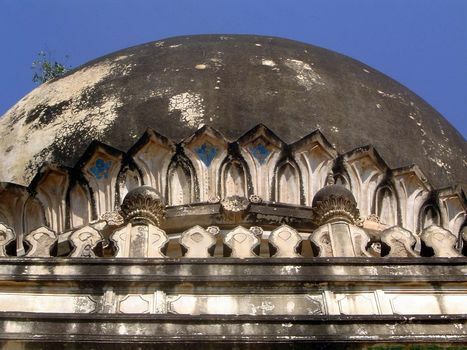 Notice how he has taken the dome of his father's tomb, made the base octagonal, and jacked it up with a second story. The third king of the dynasty was Ibrahim Quli Qutb Shah, the youngest son of Quli Qutb Shah. Like his father, he reigned for a long time, from 1550 to 1580. In the tradition of cultural blending, he learned Telugu, the Dravidian language spoken by the Hindus of his sultanate. 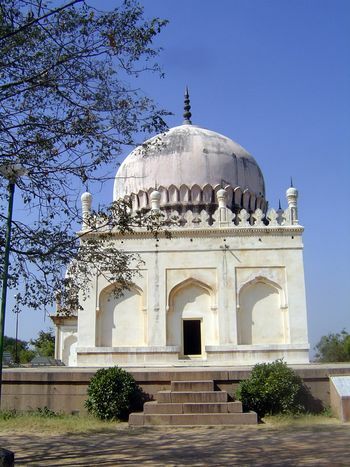 His tomb retains the vertical arrangement of his brother Jamsheed, but reverts to the cubic shape of his father's tomb. 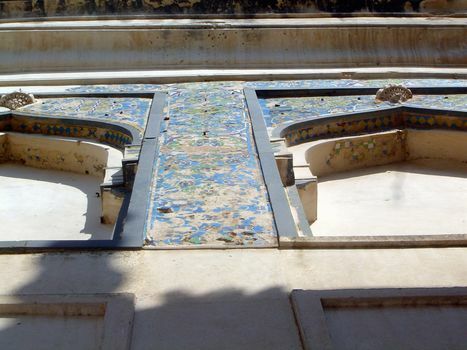 Ibrahim's tomb was once covered with the green and blue mosaics that now survive only in scabs. Not much is left of what once must have been spectacular. 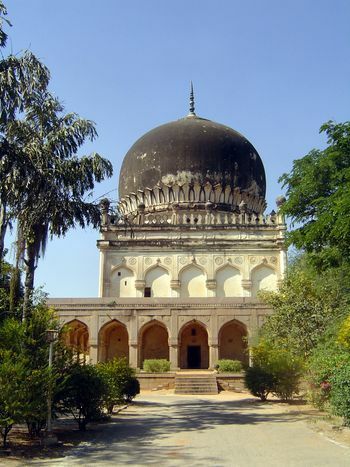 The fourth Qutb Shahi king was Muhammad Qulit Qutb Shah, who reigned from 1580 to 1612. 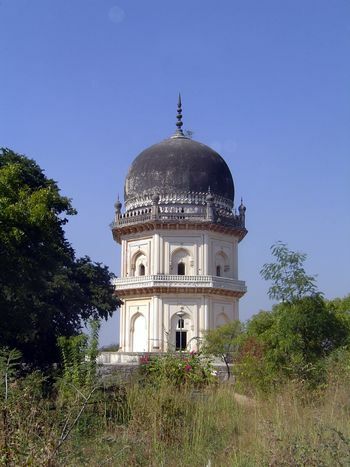 While Shakespeare was busy scribbling, Mohammad was founding the city of Hyderabad, named for Hyder Mahal, a dancer who caught his eye. 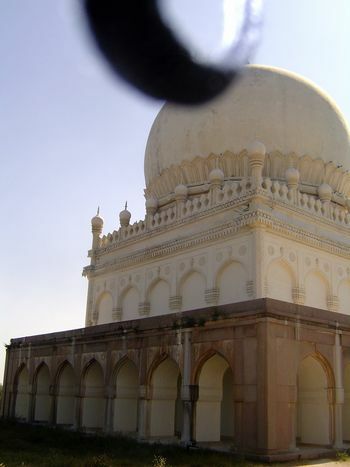 His tomb retains the shape of Ibrahim's but makes the facade more complex. 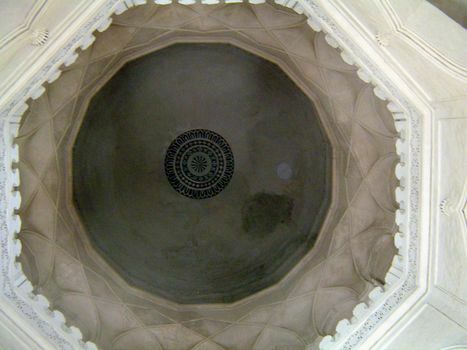 The dome of Muhammad's tomb, seen from the inside looking up. 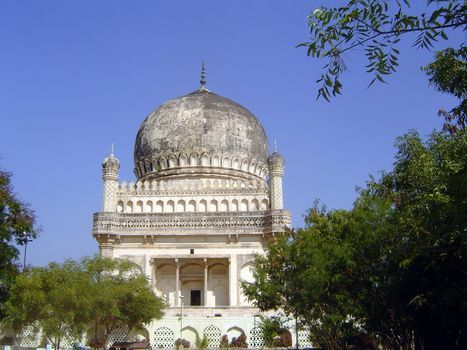 Muhammad was succeeded by his nephew and son-in-law, Sultan Muhammad Qutb Shah V, who reigned from 1612 to 1626 and built the great Mecca Masjid, the mosque adjoining Hyderabad's Char Minar. 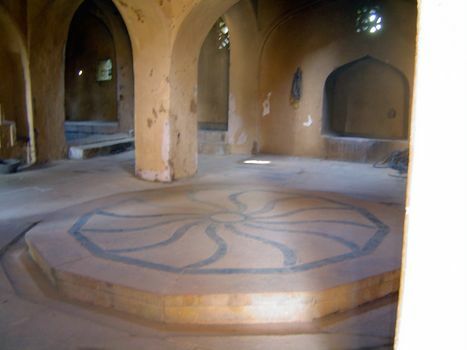 His tomb is similar to his uncle's but adds an arcade around the ground floor. 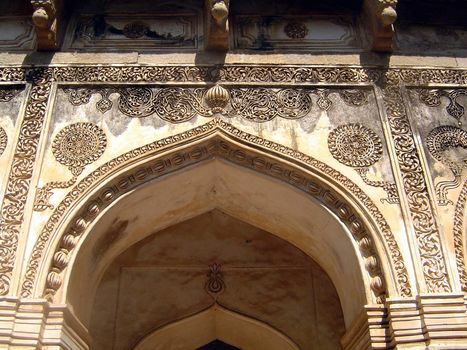 Abdullah Qutb Shah VI was the son of Sultan Muhammad and began his reign in 1626 at the age of 12. He ruled forever, until 1672. His tomb is much like his father's, as though the vein of imagination had played out. Abdullah had two sons who fought to succeed him. One, Mirza Nizamuddin, lost. 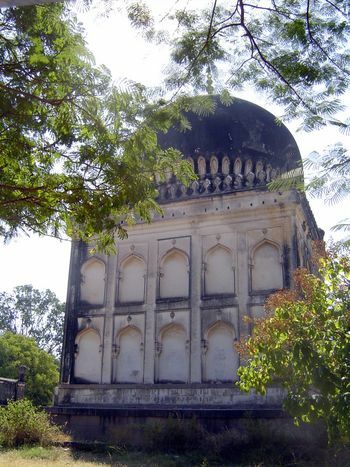 This is his tomb, abandoned while still incomplete. The winner was Abul Hasan Tana Shah VII. 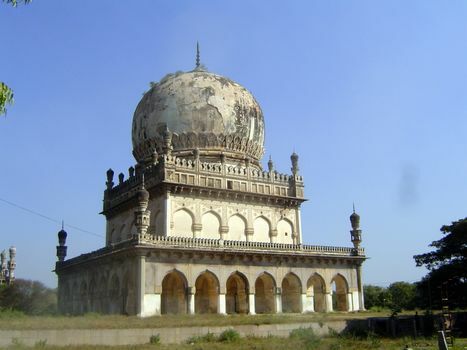 He ruled from 1672 to 1687 but was the king who lost Golconda to treachery. 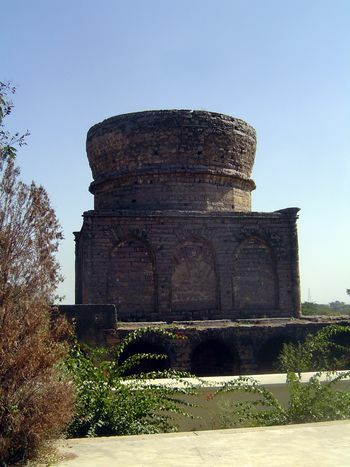 He died a prisoner of Aurangzeb in the distant fortress of Aurangzeb. It is sometimes said that the Taj Mahal had to be intended for Shah Jahan, because no Muslim woman was ever powerful enough to deserve such a structure. 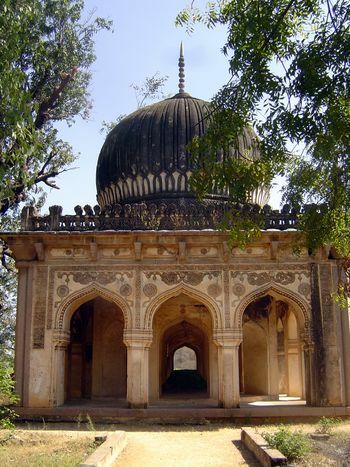 It may be true, but here is the tomb of Hayath Bakshi Begum, the only daughter of Muhammad Quli Qutb Shah IV, the wife of Sultan Muhammad Qutb Shah V, and the mother of Abdullah Quli Qutb Shah VI. Who else was buried in this cemetery? Answer: the hakims or court physicians. 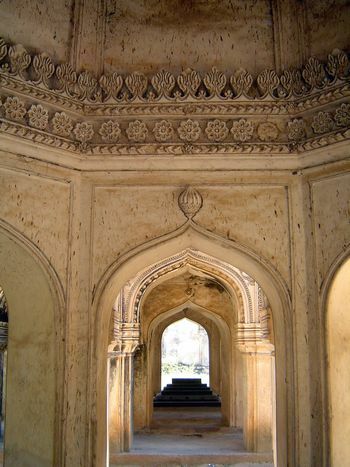 Their tombs are structurally simple but profusely ornamented. The decoration is in lime plaster. 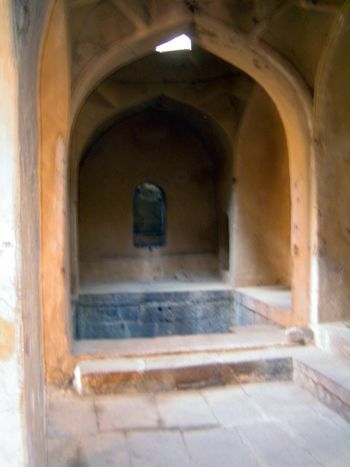 Also nearby is the Badshahi hammam, the mortuary bath for the deceased kings. Their bodies were washed on this central platform.